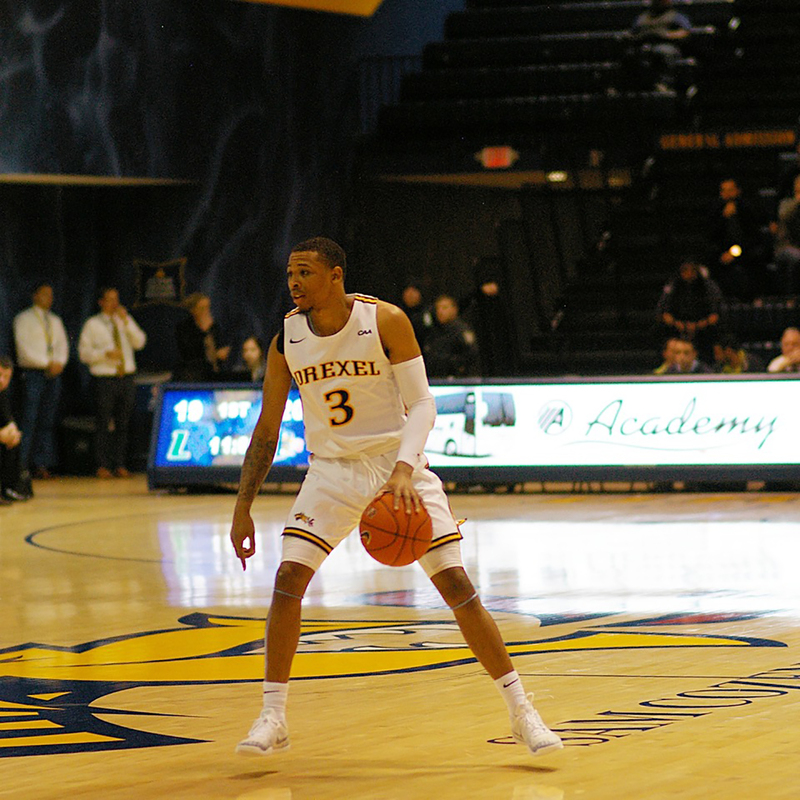 The Drexel University men’s basketball team defeated Robert Morris University by 82-69, Dec. 1, and picked up another home win Dec. 5 against Loyola University Maryland, 95-86. Drexel dug themselves into an early hole, going down 9-1 within the first few minutes. They showed some resilience and fought their way back. They kept up their offensive down pour on Robert Morris to take a 42-34 halftime lead. Halftime offered a different type of entertainment, as a loud ruckus erupted from the Dragon faithful. Sitting in the bleachers were none other than Philadelphia 76ers star Ben Simmons and supermodel Kendall Jenner. Also in attendance for the game was 76ers point guard T.J. McConnell who was supporting his brother Matty McConnell, a senior point guard for the Colonials. In the second half, Drexel took advantage of the large crowd and never let up on their lead. Sophomore Tim Perry Jr. electrified the crowd and the Dragon bench with an emphatic slam dunk with 16:56 left, to give Drexel a 14-point lead. Robert Morris closed to within 11 points around the 10-minute mark, but Drexel held on to win by a final score of 82-69. Drexel got a lot of scoring production from their older players. Junior Alihan Demir led the way for the Dragons, scoring 17 points and grabbing seven rebounds. Senior Troy Harper also contributed, finishing with 14 points, four rebounds and four assists. As a team the Dragons shot 8-19 from three and 20-22 from the free-throw line. Against Loyola, the first half was a back-and-forth battle as Loyola-Maryland led by five points at halftime. Drexel’s three-point shooting in the second half helped them outscore Loyola 52-38. Overall the Dragons shot 5-6 from three in the second half and 11-16 in the game. Graduate student Trevor John scored a career high 21 points on seven three-pointers out of nine attempts. Leading Drexel in scoring was Demir who finished with 24 points, five rebounds and four assists. The victory brings the Dragons to an overall record of 5-4, including 4-1 at home. The Dragons next game will be Dec. 8, at home against University of Maryland Baltimore County.